As promised, I'm going to announce the winners of the 1st Bookdown Contest today. First of all, I'd like to thank all people who participated this contest. I happily spent a whole week on reviewing all the 43 submissions. Then I had a hard time wrestling with myself because it was so hard to pick the best entries. On one hand, (in theory) I had to make 43 * (43 - 1) = 903 pairwise comparisons to decide the winners. On the other hand, the number of submissions which I thought should receive the awards is certainly bigger than what I planned (1 + 2 + 10). In the end, I decided to slightly increase the number of awards to 1 + 3 + 12, so that I could stop banging my head against the wall. That said, I still strongly believe some other submissions are worth mentioning in this announcement (which I'll do in the a reply after this announcement). Down Down Down! The open source river streaming down! What could be better than that? Pablo showed the possibility of publishing a book with bookdown all by yourself (i.e., self-publishing). If you are interested in self-publishing books, I courage you to read the two blog posts mentioned in the submission, which covered a lot of useful and practical technical tips. The book is open source on Github (of course!). I hope you could hesitate no more after seeing Pablo's example, and will enjoy the excitement of having a physical copy of your book in your own hands a couple of months later. I'm sure Pablo will be happy to help if you have any questions on self-publishing. 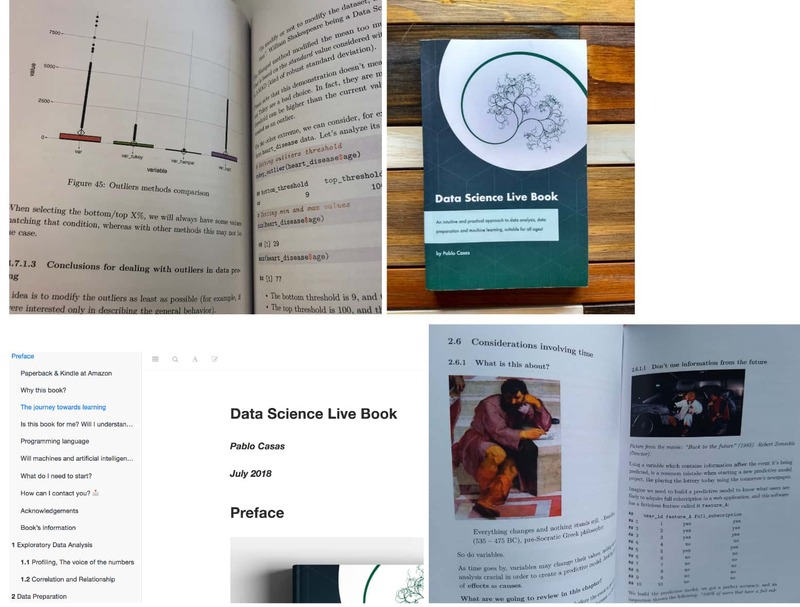 @grimbough's msmbstyle package: https://community.rstudio.com/t/14998 This is a bookdown extension package for the Tufte style. Besides a nice style, it has also provided additional features such as Question/Solution/Exercise blocks. Currently a real book, Modern Statistics for Modern Biology, is being written with this style. @grimbough has also tried to port some of the Tufte features to the Bootstrap style. There were several submissions on dissertation/thesis templates, and the above two were picked because 1) the authors have successfully graduated with their degrees, which means they must have won in the constant fight with their graduate schools (I kind of lost in 2013, so they "made it up" for me to some extent); (2) they provided both PDF and web versions of their theses. Pranav's thesis was based on Chester Ismay's thesisdown package. Chester really should have received the award, too, but I think the large number of theses, including Pranav's, is the best award for Chester. @colin's backyard package. It has basically provided a GUI for bookdown. It is absolutely amazing. If it were not still work in progress, I'd have to fight with myself for longer. @robjhyndman's Monash University templates. Students and faculty in other universities may feel jealousy about these templates, since it seems Monash can escape from the LaTeX world now. @jweisber's book "Odds & Ends". It is a beautiful and elegant extension of the Tufte style. I thumbed through the book, and it appeared to be a great book, too! @zachbogart and @jtr13's edav.info/. When will course notes follow the Wikipedia model? @ejkasner's University of Washington dissertation template. Features the use of child documents (each chapter as a child document), LaTeX customization, and bookdown::pdf_document2. @martin.arnold's interactive companion to the well-received textbook Introduction to Econometrics (Stock & Watson, 2015). @Desautm's Notes for advanced calculus in French (with some interesting LaTeX tricks). @robinlovelace's Geocomputation with R, a book containing animations, interactive widgets, and shiny apps. Also a great example of collaboration among multiple authors. @bubifengyun's book in Chinese with a large amount of LaTeX customizations, and Shanghai Jiao Tong University thesis. @yimeng's Renmin University of China thesis. Congratulations to all recipients! Please email or message me with your preferences of the awards (RStudio t-shirts/mugs) and postal addresses. Once again, many thank to all participants of this contest! @statnmap's template for custom title pages and headers/footers for PDF reports. @amrrs's extension to the Bootstrap style to imitate the Kaggle website in Tamil. @mczyz's report in English and Polish, with customizations in both HTML and LaTeX. @haozhu233's RStudio addin to help you customize the Gitbook style. Congratulations to all the winners and thank you @yihui for the first bookdown contest. Congratulations winners and Thanks @yihui for the mention. I know wouldn't get anything materialistic but this opportunity to explore bookdown slightly deeper with this contest is a nice reward. Thanks @yihui, and congrats everyone! Thank you @yihui for carefully reviewing and congratulate everyone! It has been less than 2 months since I entered into bookdown world, and now I fall in love with it (after finishing assignments in class ) ! Thanks @yihui and congrats to every participants ! Thanks @yihui for this package, it allows us to express what we explored in this data journey. Thank you @yihui! Congtats to all the winners! It is my great honor to be one of them and I have learnt a lot from the contest! Thanks @yihui! This is such a great community and toolset. I was actually thinking of submitting aggiedown, but was focused on finishing my dissertation...which I did, and they accepted it, aggiedown template and all! I'm actually more excited that other/fellow grad students at UC Davis will be able to use the template (and make it better I hope). 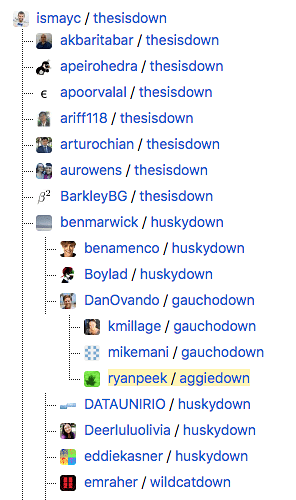 So thanks for pointing out aggiedown, and look forward to getting better at bookdown/blogdown. Thank you, @yihui! As you hinted at before, the main reward is a curated list of resources for all of us as future writers. Congratulations, everyone! Thank you for sharing your work and getting the word out. thank you very much. without your help, I do not know this contest. thanks for yihui's help.